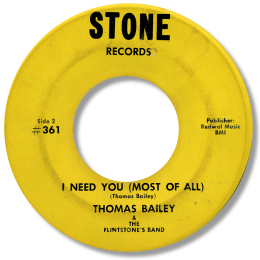 A cult figure in deep soul circles, Thomas Bailey only seems to have released a tiny number of 45s. But they are all considered “Holy Grails” by fans of the deep genre. 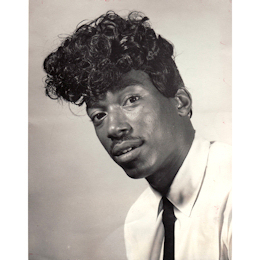 Bailey was active in the Macon area with his group the Flintstones around the turn of the 70s and was involved with local record entrpreneur Bobby Smith. He wrote material for Mickey Murray among others as well as making his own discs. His first Federal 45 coupled the ballad “Fran” with the strutting southern funk of “Just Won’t Move” but his killer release for the label was the next one. 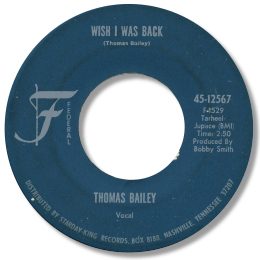 Wish I was Back is a version of the George Jackson/Raymond Moore song “Back In Your Arms Again” which Wilson Pickett cut at Muscle Shoals a couple of years previously in 1969. While Pickett’s is the more polished performance Bailey’s is the one for the connoisseur. The power and conviction of his gruff, compelling vocal leave listeners breathless. A great 45. His other rarity is the brilliant deep I Need You for the tiny local Stone label. This features another powerhouse vocal over a dead slow backing, this time with a fine horn section offering the occasional punchy phrase. Apparently Bailey still lives in the area but is no longer involved in secular music. UPDATE ~ Newton Collier writes to say with the good news that "Thomas Bailey is still active and playing great music in the churchs in the Macon area. He also helps out with music to the seniors shows." I'm grateful to Newton for getting in touch. NEW UPDATE ~ Gerritt Raws kindly writes to say the dates for these recording are 1968 and 1971. Gerritt found the info in the "Catalog of Copyright Entries, Music Name Index". I'm grateful to him for sharing this info. Note ~ both sides of Stone 110 are instrumentals written by Bailey. Thanks to Dylan Czabaniuk for pointing out the Stone 110 details.